In the last post I noted that in my corner of Arizona we were experiencing delightful winter like spring weather. Apparently I was mistaken, that was fall. This weekend, the end of April and the fist of May, the 29th annual Route 66 Fun Run took place during torrential rains, occasional snow flurries, and plummeting temperatures – and still people turned out in droves for what is essentially a fun filled 150-mile, two day block party that transforms this section of the old road into a living time capsule. 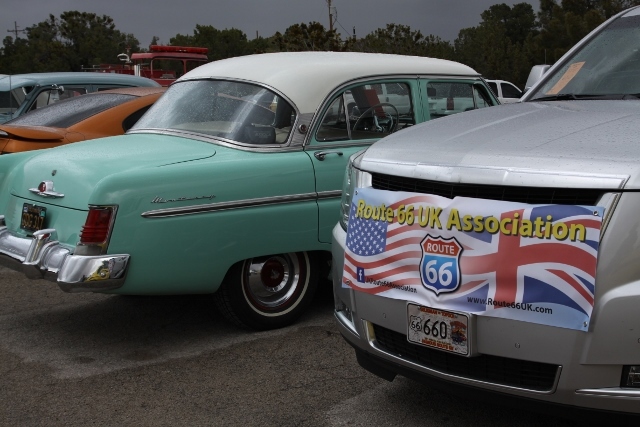 As this stellar event sponsored by the Historic Route 66 Association of Arizona is a celebration of the most famous highway in America, it also brings together Route 66 enthusiasts from throughout the world. Any Route 66 event, be it on the road itself or at de Prael in Amsterdam is also a family reunion of sorts. For this particular event my dearest friend and I were privileged to share the event, and odd winter weather with treasured friends from Albuquerque, Australia, New Zealand, Texas, and California, and new found friends from the UK and North Carolina, and points in between. We kicked off this wonderful winter weekend with a lunch on Thursday at Mr. D’z Route 66 Diner shared with John and Judy Springs, friends from California. 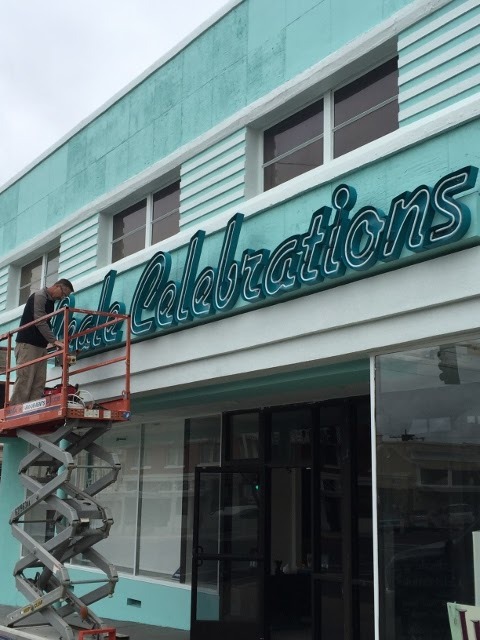 This followed the “ribbon cutting” ceremonies for the new sign from Legacy Signs that completes the transformation of the facade at Beale Celebrations. The mayor, city manager, and other city officials were in attendance, another manifestation of the leadership that is fueling the dramatic transformation of the historic business district as well as Route 66 corridor in Kingman. Also in attendance were Scott Dunton, president of the Route 66 Association of Kingman, Inc. This too seemed rather symbolic as this dynamic non-profit organization is spearheading establishment of cooperative partnerships that foster a sense of community as well as community purpose. Friday morning kicked off with breakfast at Rutherford’s Family Diner and conversation with Jess McEntire. Then we were joined by Jim Conkle, and a few other Route 66 regulars. Then, on Friday night it was laughter and dinner at the Garlic Clove shared with Kevin and Nancy Mueller, owners of the iconic Blue Swallow Motel in Tucumcari. We closed out this visit with a stroll along Beale Street in search of ice cream. 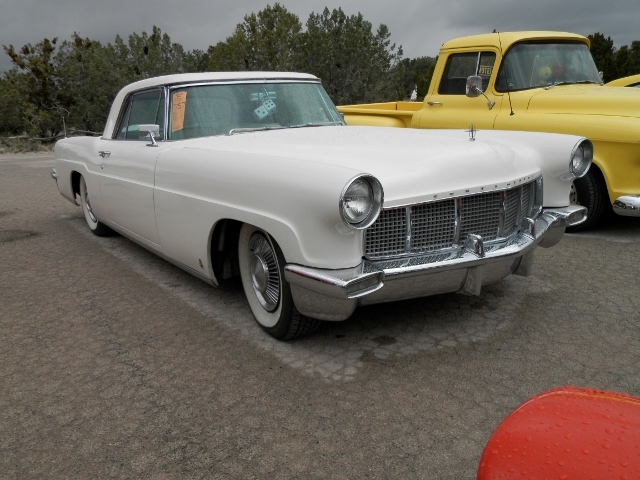 Saturday morning, under heavy dark skies, we rolled east on Route 66 toward Grand Canyon Caverns, along with dozens of vintage cars and hot rods headed for Seligman where Angel Delgadillo officially kicks off the Fun Run weekend. As were technically on assignment, the caverns was our destination (photos were to be gathered for use in various promotions of the property). Intermittent showers and sprinkles accompanied us as we drove east, and at the caverns the temperatures dropped to somewhere near forty degrees. Then it rained. Then the rain turned to sleet. Then the sleet to snow, and back to a cold rain. Still, it was though the curtain of time had been pulled back and the year 1964 poured onto the property in a rising tide that soon filled the parking lot, the restaurant, the gift shop, and even the caverns themselves. 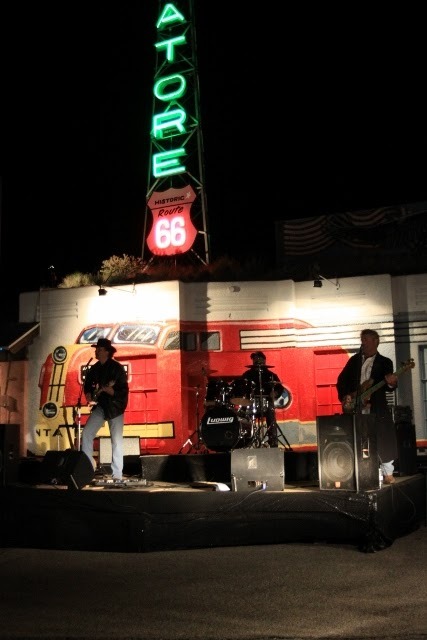 The past and present flowed together almost seamlessly, and once again Route 66 was THE Main Street of America. My dearest friend and I shared coffee and superb pie (apple for me as I had tried the chocolate cream during last weeks visit when I introduced Peter Campbell McBride of the UK Route 66 Association to the historic roadside attraction) with John McEnulty, the owner of the property who was busily greeting visitors and providing his staff with assistance. As is most often the case when traveling Route 66, there are always unexpected friends that will walk in the door, add to the flow of conversation, and in this particular instance, provide assistance in the reviewing of the fresh baked pies. In this instance it was Mr. McBride and two of his sons. The drive back to Kingman, was to say the very least, interesting. Blinding rains, dynamic cloud shrouded mountains when it lifted, and a road filled with vintage vehicles, hot rods, and very wet motorcyclists presented fascinating contrasts. Floyd and Company Barbecue, formerly Redneck’s on Beale Street became the rendezvous lunch destination. Conversation and laughter flowed as Mike and Sharon Ward, George and Bonnie Game, and Tim Kikkret of the Canadian Route 66 Association, Sean and Karen Evans from Flagstaff, and other friends shared tales from the road. As the sun now dominated the skies, and the dark clouds crowned the surrounding mountains to serve as a stunning backdrop, we followed a wonderful lunch with an impromptu tour of the historic business district. I just couldn’t resist sharing the exciting developments that have taken place since our last visit. Another recurring theme wherever Route 66 enthusiasts gather is food. So, on Saturday evening my dearest friend and I joined with tour groups from New Zealand and Australia, and friends, for an excellent dinner and show at Ramada Kingman that included announcements about the Route 66 photo contest. In spite of rather brisk temperatures a few of the faithful gathered under the neon at the El Trovatore Motel for music from Jess McEntire, beer, and barbecue courtesy of our hosts Sam and Monica Frisher, owners of this venerable old classic. In spite of an evening that ended a bit latter than is customary in our home, we returned to the Ramada Kingman for an early morning visit with Dale Butel, owner of Australia based Route 66 Tours. It was our first encounter with legendary Vegemite. Then I spoke with his spring tour group about Route 66 in western Arizona and Kingman history, answered questions, and signed copies of Ghost Towns of Route 66, a souvenir that Dale provides to each group. We followed this visit with even more food. This time a rather disappointing breakfast (lengthy wait even for coffee, longer wait for food, very greasy – not at a restaurant on the Route 66 corridor in Kingman) that was made somewhat acceptable by the laughter punctuated conversation, a few tall tales, and the camaraderie of friends. After a series of long and protracted goodbyes were said, we provided a condensed tour of the wagon road to the May’s from Las Vegas. This was something that had been promised on a previous visit. So ends another Fun Run weekend. Now, plans begin for next years event, and another opportunity for memory making fun shared with friends.